Thea Munster, Boneyard Betty—if she’s a fiend of yours, you are probably also a big fan. 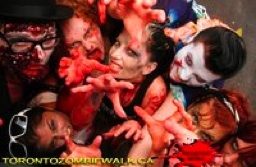 She’s gore-geous and committed—as any ghouly girl should be—to grave matters … like the Toronto Zombie Walk. Just trying to keep up with her deliriously dark doings makes my head spin (a kind of Exorcist move that’s really quite thrilling). So I thought I’d ask her a few questions, pick her brain, so to speak, and all it did was make me hunger for more. Q. How did you become interested in zombies? A. I really liked horror movies when I was young. I loved to be scared. But nothing terrified me more than Night of the Living Dead. I think I was about 11 when I saw this movie and it changed my world. I always identified with the idea of the “monster” as social outcast or the misunderstood. But the zombie is also a monster that has power in numbers, one that doesn’t do so well solo but can take down the world when it’s with its individual counterparts. And I say individual because I think each individual zombie has its own style. When I realized this, I wanted to raise the dead and have my own zombie community. Q. Who is Boneyard Betty and where is she now? A. Boneyard Betty was an alias I used when I was a writer for 1313 Magazine. We all had different alter egos. Mine drove around in a hearse and collected bones. It’s not far from the truth, I do own a hearse. I think she’s still on twitter. Q. Could you name a few ways a zombie passion manifests in your life? A. It’s very hard to feel passion when you’re dead. Right; that was actually kind of a dumb question. Q. What is the connection between punk rock and zombies? A. Well, as I see it, it’s the power in numbers thing. We can rise up against the status quo as individuals in a collective group. “They call us walking corpses…unholy living dead”~ The Misfits. Q. You are the founder of the Toronto Zombie Walk. How did it start. What are your goals? 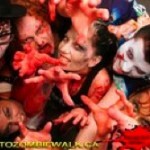 The Toronto Zombie Walk is the original zombie walk. I believe there was a zombie “parade” held to promote a movie before this time, and I’m sure there were plenty of other zombie events. But, the idea of a “zombie walk”, in name and as a public event and not a promotional tool started in Toronto in October 2003. As a horror fan in Toronto, I had quite a few friends who liked horror, but not a lot of friends who actually wanted to dress up as a zombie. So, I decided to have a zombie walk and put up flyers everywhere and see who came out. Only 6 people showed up. One of the girls who attended the first walk, Heather McDermid, started one in Vancouver the following year. From there it spread to San Francisco … now it’s even in Russia! I would really like to see the zombie walk stay grass roots, and be an open, fun, free event that allows people to “get their dead on” in extreme costume and gore. But, it would be amazing to have some hearses involved and, if I could ever afford it, street closures for a “street meat” party afterwards. I would also like to see more independent horror talent in the horror scene coming on board with their movies, art, etc. Q. What makes Toronto (and certain other cities worldwide) so attractive to zombies? A. Zombies seem to lurch towards cities. There’s more living beings to eat. But also, everyone, even zombies, want to be where the action is. Toronto is very proud to be the new home to George Romero, as well! It’s really helped to promote zombie love within the city. Q. Other than the walk, how do you like to fill your zombie calendar? So, there you have it: crypts, scripts, Night of the Living Dead, an absence of passion, George Romero and the Toronto Zombie Walk. Ah, Thea, stalk on, and may the fierce be with you! Congrats Erin – looks like you've found your “people” all over the continent/world. Appreciate the questions you ask, as I'm sure your fiend/friend enjoyed answering them. Who else you got on your list? Look forward to more of your interviews!